The following article, from Suzanne Alberga, Executive Director of BGR’s long-time partner, the What If? 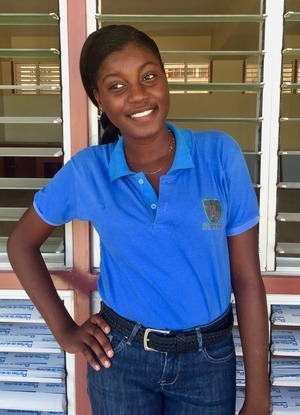 Foundation, features an interview with Cadet Fridelène, a student in Haiti who recently graduated high school through a scholarship from Na Rive, a program that BGR has been supporting over the past few years. She also speaks about the Father Jeri School, which a grant from BGR has helped to equip and staff. 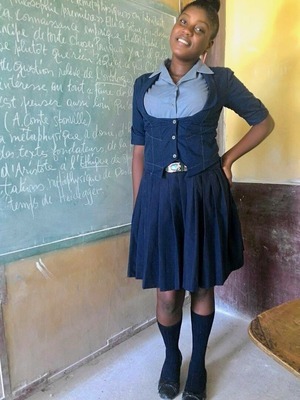 Na Rive scholarship student Cadet Fridelène will not be returning to school this year. And it’s for the best possible reason: she graduated in June! Cadet is entering a world of possibility that would not be open to her without your support. She is a wonderful example of the intelligence, determination, and hope that our partner, Na Rive, see in their students every day. And as you’ll hear from Cadet, the financial support and encouragement she received over the last six years has changed the course of her life. The Father Jeri School begins its second academic year in just a couple of weeks. With your support, we can change the lives of many more children and expand the grade levels offered at the school so students like Cadet can proudly graduate in their own community. Hello! Thank you very much. How long have you lived in Ti Plas Kazo? I was born there, but had to move to Tabarre five months ago because my mom got a job there. We had to leave the house my grandmother lives in and everything I knew and was used to, which was hard. How long have you been part of the Na Rive programs? I’ve received scholarship support from Na Rive for six years, and have also attended the summer camp and field trips. I took music classes at summer school and I’ve been to museums, the library — I even took my first trip to the beach, all through Na Rive. I would be in a very different place without them. What is your favorite subject? Why? Philosophy. It was my last subject in school, so I made an extra effort for it so I could finish my studies. My physics professor. I just love physics. I would like to have a job to take care of my family. I’m the eldest and my family is so poor so I want to provide for them. If I could keep studying, I would like to do business administration or accounting. What do you think about the new Father Jeri School? It’s amazing! I have lived in Ti Plas Kazo all my life, and there has never been anything else like this. I like everything about it: the beautiful building, the rules that teach students respect and leadership, the competent teachers. It’s excellent! I am excited for my younger friends who will be able to study there. Finishing school! I am the first to finish school in my family so it’s like a dream come true. Students like Cadet represent the future of Haiti — they inspire us to do more, think more, give more. We wish all students a wonderful start to the school year, both in Haiti and wherever you call home. Stay tuned for more news about the Father Jeri School in the coming weeks! This entry was posted in Education, Engaged Buddhism, News item, Projects & programs and tagged Engaged Buddhism, Girls' Education, Haiti, What If Foundation. Bookmark the permalink.